This easy recipe will be your new go-to salad. Fresh veggies, corn, cheese and ranch dressing make an amazing flavor combination. 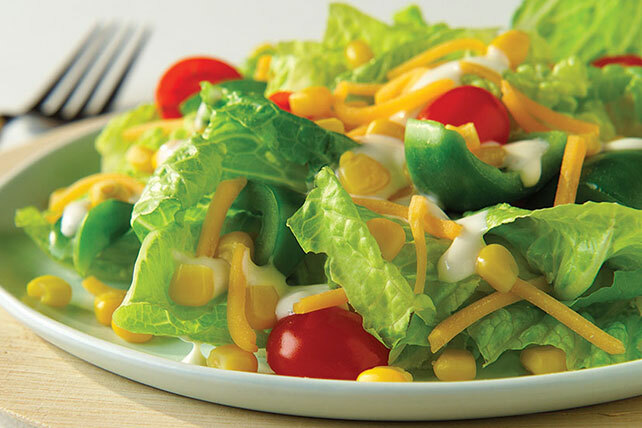 Toss lettuce with corn, tomatoes and peppers in large bowl; sprinkle with cheese. Save 30 calories and 3g of fat, including 1g of saturated fat, per serving by preparing with KRAFT 2% Milk Shredded Sharp Cheddar Cheese and KRAFT Lite Ranch Dressing. For extra flavor, use grilled corn on the cob instead of the frozen corn. Just grill corn until tender, then cool slightly. Remove kernels from the cobs. Substitute 2 cups of the grilled corn kernels for the package of frozen corn. Substitute 1/4 cup KRAFT Grated Parmesan Cheese or 1/2 cup KRAFT Natural Sharp Cheddar Cheese Crumbles for the 1/2 cup shredded cheddar cheese.